Straight from Sony’s big event in New York we give you the dibs on the newest PlayStation 4, its features and the new gaming experience it will provide to consumers in the very near future. And if you’re following the breadcrumbs that lead to this event, you’ll be happy to know that most of the rumours about Sony’s newest gaming console were true. For starters, the PS4 will be powered AMD’s x86 processors coupled with an enhanced GPU and 8GB GDDR5 of unified high-speed memory that is expected to bring blistering performance in terms of graphics and processing. Previous reports about the new controller were also confirmed today. The new PlayStation controller features a touchpad, a share button, a headphone jack and a light bar to identify players. There’s also a 3D camera that allows the console to track the movements of the controller via the light bar. Much effort was also put into the design of the console in order to bring the best possible experience to gamers. The new PS4 will have a low-power state that allows users to instantly suspend or resume a game with a touch of the power button. It will also be equipped with a secondary custom chip that will be responsible for background processing. This means that multitasking on the PS4 will be improved allowing users to download games in the background and even with the power off. Social also plays a pivotal role in the new PS4. Sony hopes to make their new gaming console as socially engaging as possible, giving users the ability to share videos of their gameplay in an easy and quick manner. Users will also be able to watch games as they’re being played, with a chat windows or “reach out” and play on friend’s system. Moreover, Sony partnered with Facebook and Ustream in hopes to make the PS4 the social platform for gaming. With this partnership, gamers will be able to interact with other gamers while they play, post to their screen as they play and even allow their friends to take over the controller. Another nice feature of the new PS4 is its ability to integrate content among different devices, making it possible to view videos recorded from the console to your smartphone or tablet. For this reason, Sony developed a Playstation App that will enable iPhone, iPad and Android devices to become second screens. Lastly, Sony has developed the PS4 to suit your personality. The system learns your likes and dislikes and will recommend things based on these preferences. 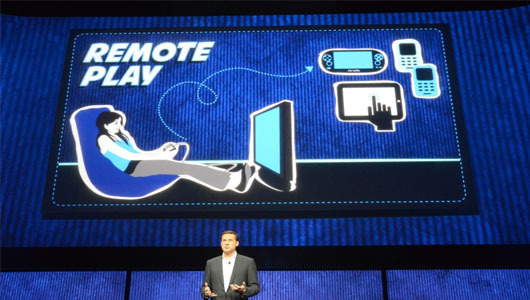 The PS Vita was also highlighted in the event as Sony is planning to make every PS4 title playable on the Vita but for now remote play is the only feature of the PS Vita that integrates with the console. On the other hand, rumours about game streaming over the internet weren’t completely true. Although Gaikai and its services were also mentioned in the event, it seems that Gaikai’s participation in the development of the PS4 (at least for now) is to facilitate remote play for PS Vita which effectively makes the PS4 a game server. As of the moment, PS3 titles aren’t natively supported in the PS4 but Sony said they hope to bring this feature in the future. So that’s just about it for the new PlayStation 4. Is there anything in particular about it that made an impact to you? Do tell us by leaving a comment below. You can also find us on Facebook and Twitter or subscribe to our site for more PS4 updates.